Today’s work conditions create more feelings of anxiety, tension or pressure, and as a result there is low productivity, reduced income, professional stagnation or even dismissal. 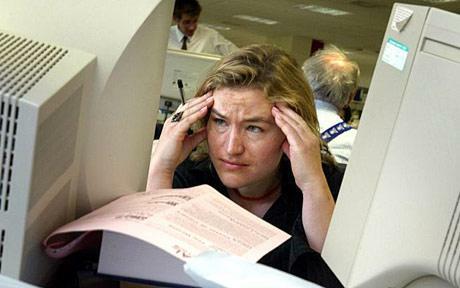 According to surveys, 80% of stress is due to conditions prevailing in the workplace. To deal with stress and be able to achieve what you want in your career you should consider the advice of specialists regarding ways to manage stress. First you must determine whether you are stressed and then find the cause of stress. As regards the sources of stress in the workplace, these are varied. Some relate to the role of the employee, others are specific to certain professions and others are related to working conditions. Working environment, with strict and rigid rules. Find what is causing you stress in your environment and observe your emotional and physical reactions. Do not ignore the problem in the hope that it will pass. Most times it gets worse. Identify what you can change. If you cannot change your environment or to reduce stress, take care of yourself, make breaks more often, exercise, watch your diet. Reduce the intensity of your emotional reactions. Do not try to please everyone around you. Put priorities, all the things with which you deal are not urgent. Try to see the positive side of things and not always the negative. Use relaxation techniques and meditation to reduce tension in the muscles and breathing to help restore the normal pace. Even 10 minutes a day helps considerably in reducing physical symptoms of anxiety. Avoid alcohol, smoking and large amounts of caffeine, because they tend to increase any physical symptoms of stress. It is important to sleep well and not disrupt the program of your sleep. Develop friendships and relationships that support you mentally. 1. Your time schedule should be a decision making tool. 2. Your time schedule should be flexible. 3. Your time schedule should make efficient use of resources. 4. Your time schedule should have clear targets. 5. Your time schedule should clearly define priorities. As regards the time management you should consider the situations in your work in which you loose unnecessary time, precious minutes and how you can save this time. Visitors are one reason that several times forcing you to stop your work. You can deal with them by closing the door of your office, avoiding discussions that do not lead anywhere. In this case you must acquire modern equipment, to keep notes while you speak, and be prepared to tell the most important when asked. You can also loose valuable time from the lack of organization of your office. So discard the unnecessary paperwork, write to the organizer about your business or even better on a schedule that exists on computers. Leave on your office only the current work and arrange the office space by placing relevant documents and tools in the same position each time. Generally you should know that all these solutions would perform better if you have the opinion of a professional career advisor or psychologist, because for each person the conditions of work are unique. Of course, if none of the above measures does not help reduce workplace stress, you may need to follow more drastic solutions, such as the search for job that is more satisfying. Remember that to grumble about your job and your boss constantly is equally futile to silently tolerate a situation that erodes your health and your career. Good article on how to handle stress. A lot of people are feeling it these days with the economy! These are all correct. Almost all of these are the cause of my stress. I will definitely try those stress reliever suggestions. Either try to cope up with the stress or tend my resignation.Life’s hard!